On February 7, the Fish and Boat Commission cautioned ice anglers and others that changing weather conditions can affect the stability of ice on lakes and ponds. On February 2, several recreational snowmobile and UTV (Utility Task Vehicle) operators had to be rescued after falling through the ice on Lake Wallenpaupack in Pike County. Nick Spinelli, Lieutenant with the Tafton Dive Team and Executive Director of the Lake Wallenpaupack Watershed Management District says in a pair of separate incidents, six people accidentally ventured into an area of open water. The area of concern is located several hundred yards offshore north of Epply Island between Shuman’s Point and Spinnler’s Point. Spinelli said bright sun reflecting off the ice and snow on the lake surface may have affected visibility. In both incidents, an ice fisherman was credited with contacting authorities and assisting with a successful rescue. All victims were taken to a local hospital for treatment of hypothermia. One snowmobile and two UTVs were lost through the ice. -- Always wear a lifejacket or float coat while on the ice. Avoid inflatable lifejackets, which do not perform well in freezing temperatures. -- When arriving at the water's edge, visually survey the ice. Look for open water areas and signs of recent changes in water levels. Ice sloping down from the bank can indicate a recent drop in water level, while wet areas on the ice can indicate a rise in water level. -- Listen for loud cracks or booms coming from the ice. This can be an indicator of deteriorating ice. -- Look for new ice, which is clear or has a blue tint. New ice is stronger than old ice, which can appear white or gray. -- Remember that ice thickness is not consistent across the surface of the lake or pond. -- Beware of ice around partially submerged objects such as trees, brush, embankments or structures. Ice will not form as quickly where water is shallow or where objects may absorb heat from sunlight. -- Anglers should use an ice staff to probe ahead as they walk. If the ice staff punches through, retreat to shore slowly. -- Always carry a pair of ice awls, which are handheld spikes. 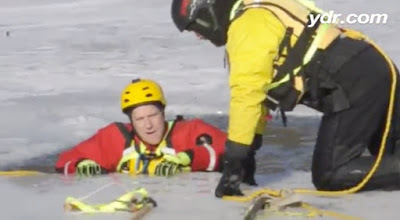 Ice awls can assist in performing a self-rescue, in which the spikes are driven into the ice to help someone pull themselves out of the water. -- Never walk on ice that has formed over moving water such as a river or stream. -- Never go out on ice alone. -- Always let someone know your plans and when you expect to return. Those who are new to ice fishing can get started by visiting the PFBC’s Ice/Winter Fishing webpage. A list of PA’s Best Fishing Waters and maps of submerged habitat structures are also available.